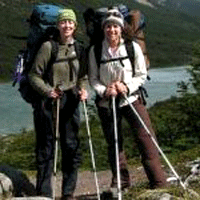 I had an excellent experience trekking with Himal Ghale in the Langtang region on Sept. 2007. Himal was very professional and was familiar with the trails, geography, and cultural traditions of the people and areas we visited. His friendly personality and positive outlook made the trek very enjoyable. He had a good rapport with the tea-house owners, which allows us to spend more time talking with these families, and made my experience very culturally interesting. Himal spoke excellent English and could translate easily, on our last day in the Langtang Valley Trek, Himal woke me up at dawn to go hiking under crystal clear skies- As this was a monsoon Hike, This clear morning was extraordinary. I felt that Himal always went the extra mile – I was able to see the sun coming up over the Himalayan peaks ringing the Langtang Valley – A spectacular view and fantastic experience trekking in Nepal with Himal!